This box enables you to build up to 48 medieval infantry soldiers of the 12th/13th century. Several weapon options like spears, swords, axes, maces and crossbows are included. 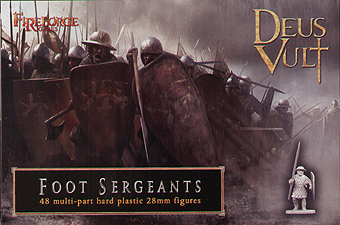 You'll be able to build up to 24 Crossbowmen and/or up to 48 Foot Sergeants figures. This is a great box, and similar to the Conquest games Norman Infantry, though it has 4 extra men, and 24 plastic crossbows, with arms to hold them in different ways. The shields are separate to the left arms, so good for modelling, though only Kite shape, and 36 spears though these are already in the right hands. There are also lots of other hand weapons and 12 each of five different helmeted head so lots of variation. Only down side is no bows, but you can't have everything!